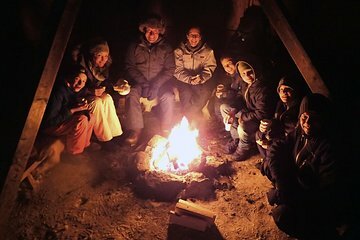 Durante el invierno, diríjase al aire libre en Tromso en una excursión nocturna con raquetas de nieve. Durante el recorrido, camine a través de los bosques nevados en sus raquetas de nieve, y deslícese en trineo por las colinas. Calienta junto a una fogata mientras escuchas historias sobre el área y bebes una bebida caliente. Incluso puede probar un refrigerio finlandés tradicional antes de llamarlo una noche. Ir en una noche de espectáculos a pie por los bosques cercanos. Caliéntate junto a una hoguera y escucha historias sobre Tromso. Disfruta de una bebida caliente y de un zurdo, un aperitivo tradicional finlandés. Transporte de ida y vuelta desde el hotel Radisson Blu. Dress warm in January! It was a little icy, but we had a great time with Matias. He was very fun to talk with and you could tell he loves his job. We didn't get to see the Northern Lights due to weather, but we had a lot of fun sledding and snow shoeing. Fire was nice to warm up to as well. This was a lot of fun and our guide was great, really nice guy. However, having mentioned we were 1st time beginners, we would have appreciated quite a more comprehensive introduction to cross country ski, in order to avoid a lot of frustration of bruises in the first 15 minutes. After a while, we got the hang of it, had fun, but we got almost no introduction to the techniques. Something to improve in the future. This tour was so much fun and really reminded us of going back to our childhood especially the toboggans. The guide Magnar was brilliant and gave us some useful tips and instruction. The whole area they take you to is less than 15 minutes from the centre of Tromso and it really is beautiful to see. We enjoyed it so much that we actually walked up there the next day just to have a walk around after so much snow had fallen overnight. The hot drink and the traditional Norwegian cake were also delicious and very welcome after the energy we spent skiing and walking up hills to toboggan down again. Brilliant fun!